Bir KULLANILAN arıyorsunuz X-PRESS 100-3000 FRONT ? 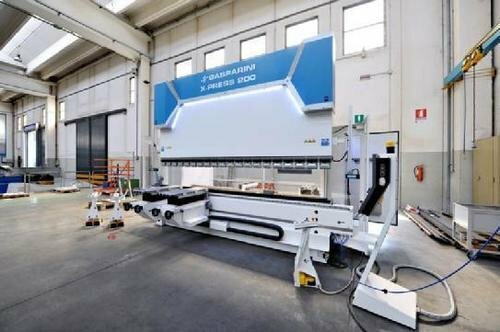 X-PRESS is the result of the innovation strategy of Gasparini combined with 40 years of experience in the design and production of press brakes. Its wide range is able to satisfy the most sophisticated and complex customer needs, thanks to flexibility, high performance and high quality standards. The X-PRESS is available in a wide range of models and powers. A skilled technical office and a flexible manufacturing plant allow to produce even very high tonnage machines, with any bending length. With stand alone, tandem and tridem configurations, with a wide range of accessories (back gauges, front supports, clamping systems, sheet followers, controls, etc. ), with tailor made approach, we always guarantee the best solution for every production need and every set of technical and economic constraints. We are an Italian manufacturer, specialized in the production of top level Press brakes and guillotine shears. We exist to make bending and cutting sheet metal a quick, precise and reliable process. We try to make our Clients more productive and competitive. We want to be regarded as the most authoritative actor in the sheet metal working sector. We aim to become more and more the point of reference on theory and practice of bending and cutting. For this reason, we invest a lot of energy in the development of new technologies and in the creation of innovative products. Our goal is to provide the best customized solution for the most demanding customers. We offer our knowledge to guide the customer in the purchase process, with the aim of guaranteeing the product that best suits to their needs. Yeni satın almak isteyen GASPARINI X-PRESS 100-3000 FRONT ?